My blog posts lately seem to be taking on a theme. I read an article online, it makes me cringe, and so I want to blog about it to uncringe. Maybe I need to stop reading articles online…. Eh, but there ARE some good ones. But today’s cringe-worthy article was about worshiping God. Okay, I take that back. I didn’t actually cringe at the article. It more provoked thought and reminded me of many moments I’ve heard Christians talk about this particular subject–on both sides of the argument–and cringed at their speech. How we worship God– in particularly, the music with which we use to usher us into worship. First, let me just say. Doesn’t that just seem kinda crazy? We ARGUE about how to worship GOD? Side A: I love contemporary music! That old stuff is boring and just doesn’t put me in the mood to worship. It’s tired and old and won’t attract non-Christians. We’re supposed to be a light to God, how can we do that with boring music? Side B: I love old hymns! The new stuff is just all emotional fluff, trying to put on a production to please people and not God. It’s no different than that horrible rap stuff they play on the radio. It’s all about ME and has no truth in it at all! Worship is for GOD, not for us. To sum it up bluntly, we’re telling each other, “I worship God the RIGHT way, YOU worship God the STUPID way.” Maybe we don’t use the word stupid, but we might as well have. 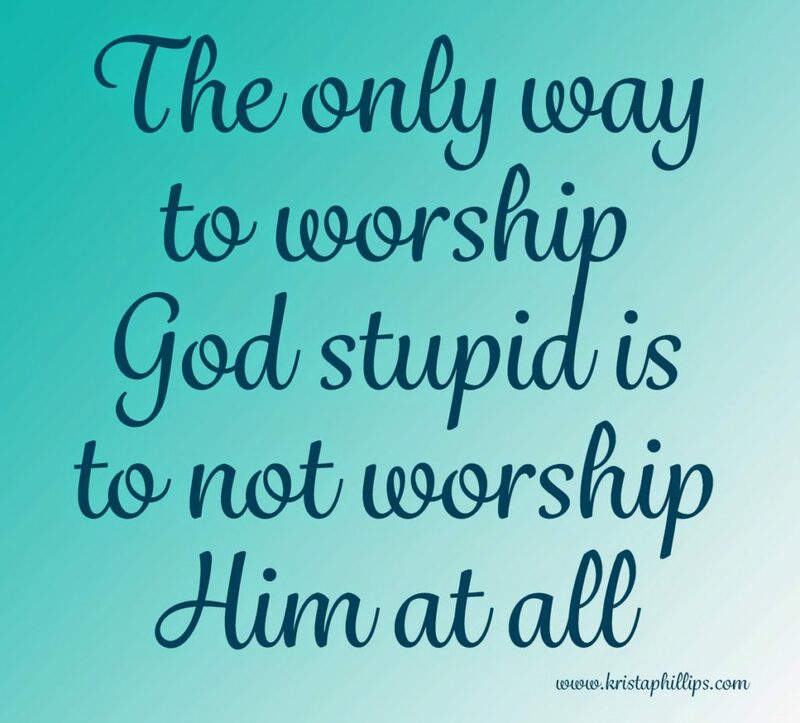 The only way to worship God stupid is if you fail to worship Him in the first place. I’ve been in churches that have upbeat, contemporary music but the worship feels flat and non-existent, focused on boosting our own egos instead of lifting up the name of God. And I’ve also been in churches that have traditional music where it felt like the only thing worshiped was the dinner they anticipated eating after the closing Amen. In both cases, worship of GOD wasn’t really happening, regardless of the music. And in full confession, I was definitely one of the guilty in the crowd too! I think if we’re honest, we can all raise our hands to that one. I’ve been in churches with that same upbeat, contemporary music when you could almost physically touch the worship being lifted up to God. And I’ve been in churches where classic hymns and organ music and harmonies are sung with hearts of praise and worship, and the sweet peace and love of God swirled through the room as hearts gave themselves over to the God they sang about. Worship is about our hearts lifting up the name of God. It’s about connecting on a different level with Him in song. Worship happens on a heart level, not a music level, and not even on a word level. God has made us all unique. Our music preferences have been formed through things like our experiences, our culture, and honestly, God breathed in the uniqueness of our emotions. Isn’t it cool that we can have variety? Isn’t it cool that we have SO many churches with hearts that LOVE Jesus through a variety of music? We are all the body of Christ. But some of us bob up and down to the music and some of us sway. Some of us sit and some of us stand. Some of us bow down and some of us raise our hands. Can we have discussions about worship and what kind we like? Yup. Can worship leaders have good discussions on how they feel God leading them to usher a congregation into worship? Absolutely! But none of that is arguing. None of that is pointing fingers. None of that is divisive. Let’s not let the heart of lifting praise and adoration to God be a point that divides us. ‘Cause that, my friends, is what the enemy wants. Let’s stop arguing about how to worship God, and instead, spend that time WORSHIPING. Discussion: What about you? Do you have a type of music that helps usher you into worship?Are you a swayer or a clapper or a sitter or a stander? Any favorite worship songs? Personally, I love the current worship music, but still have a heart for the hymns. “You Make Me Brave” and “Oceans” are two of my MANY favorites, but goodness, “Amazing Grace” and all the “Power in the Blood” songs are just AWESOME! There are WAY too many to list!!! Lynn, exactly! Worship at its core is a matter of the heart! Awesome post! Isn't it crazy how the body of Christ argues and hurts one another? Gosh, with those behaviors Satan can sit back and relax because his dumb goals are being met without him lifting a finger. We should rejoice that we are all created to honor and live God in the way He created us to do so. Thank you, Marci! You're too sweet!! I agree, one of Satan's big tools he uses is to create riffs in the body of Christ amongst each other. We become ineffective when we're too busy tearing each other down rather than lifting up the name of Jesus and doing God's work. On the flip side, there is value in encouraging each other toward holiness and not allowing sin to infiltrate the church. There is a fine line between judgment and condemnation that belong to God only and encouragement and holding each other accountable. Never Once by Matt Redman. We listened to it in the hospital while my daughter was recovering from her third open heart surgery. Shannon, that's a GREAT song!!! Totally agree. Some arguments among believers really send me over the edge because they are so ridiculous. I actually enjoy a balance of contemporary and hymns, but my personal preference isn't the right one! Yes, we argue about lots. There are some valid disagreements…. but even in our disagreements, we need to show love!!! It is amazing the things Satan has us arguing with each other about sometimes! Thanks for the reminder to watch out for places I'm trying more to be right than righteous. "I'm trying more to be right than righteous"
Oh. My. Goodness. I LOVE THAT!! !